We all want to avoid holiday weight gain. All the office parties, alcohol and calorie rich food means lots of temptation, but your weight loss journey doesn’t have to be put on hold. You can keep making progress. You don’t have to wait for 2018 and New Year’s resolutions. 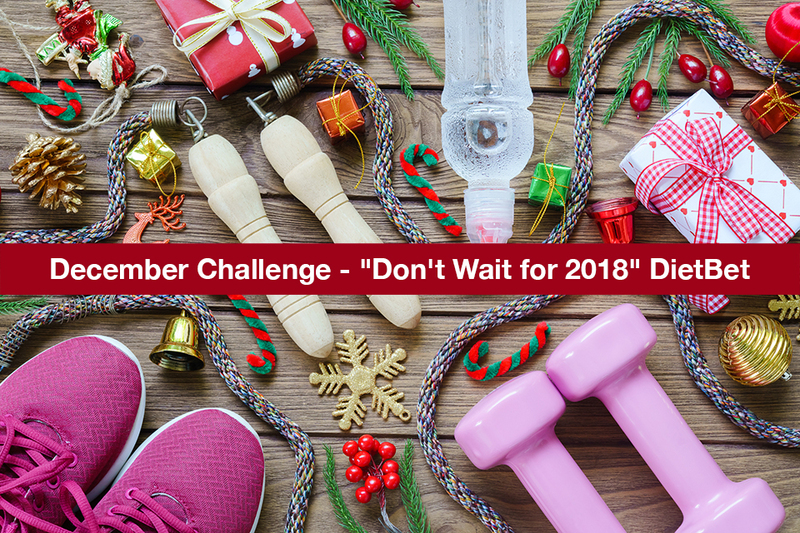 Join our December Challenge today. The fun starts on Dec 7th! Step 1: Join our December DietBet for some serious motivation and incentive! – The bet is $30 and we are pledging to lose 4% of our weight in 28 days – Dec 7th – Jan 3rd. A DietBet is like an office weight loss pool. Everyone who reaches the 4% goal splits the pot. In our October DietBet, participants lost more than 1200 pounds combined and the pot was $5550! We want to make the December pot even bigger! Get the full details and Sign Up today! – The initial photo weigh-in takes place Dec 5th-7th. Bonus Stakes Giveaway: We are doing 3 giveaways during this month’s DietBet. You must be signed up to participate in the DietBet and weighed in by Dec 12th 11:59pm PST to be eligible for the giveaways. Winners will be chosen at random. Step 2: Commit to 3 simple lifestyle changes from Dec 7 to Dec 30th. Make water your main beverage – Drink at least 64 oz of water each day. Limit/manage your carb intake: Keep your carbohydrate intake at 100-150 grams a day or less. (That’s 400-600 calories of carbs per day) Carbs can get out of control during this time of year. Not just from sweets, pasta or bread, but also from alcohol. Don’t forget to count all liquid calories. We suggest that you use an app to track your carb intake. Some great options are SparkPeople, MyFitnessPal or LoseIt. NOTE: If you already have a daily goal for carbs and that goal working for you, keep doing what you are doing. You know your body and your needs. If you are already living the low carb or ketogenic life, your carb count is likely much lower than 100 grams, so you are all set. If you are vegetarian or vegan, focus on eating 80-100 grams of plant-based protein each day. Step 3: Leave a comment below and let us know what your weight, health and/or fitness goals are for December. Join our January Jumpstart DietBet Today! My goal is to get back on track and lose some weight. I’m in. My goal is to reduce sugar and lose weight. I’m beginning my weight loss journey again so my goal is to lose at least 10 pounds off my starting weight this month ! My goal is to be consistent, get back on track and lose more weight. My goal is to reduce sugar and lose weight. My goals are too jumpstart 60pd weight loss and incorporate daily exercise. I weigh 210 pds and it is effecting my health. Joint pain, lethargy and overall Lowe self esteem is what I’m battling. I’m in procrastinating is not good for me.